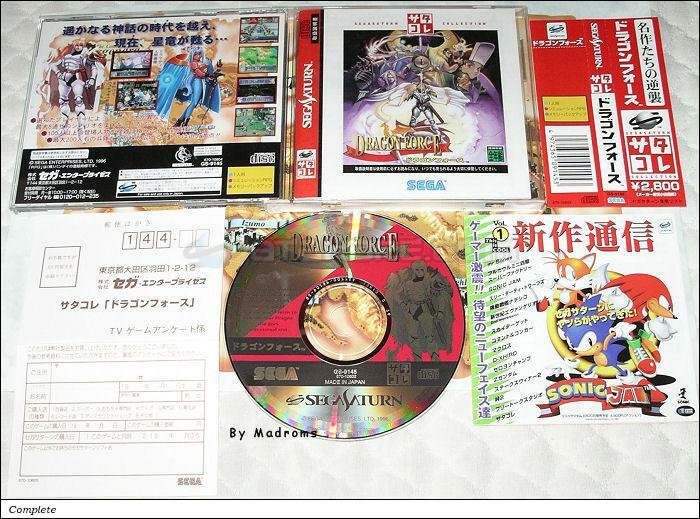 Dragon Force (Satakore) (ドラゴンフォース　（サタコレ）) is a Simulation - RPG game, published by Sega Enterprises, Ltd., which was released in Japan in 1997 for the Sega Saturn. Dragon Force is a strategy game with rpg elements sprinkled throughout. You must choose a general, build an army and go kill everything. The game has beautiful cutscenes with decent dialogue to build the story, and plenty of rpg styled menus to manipulate and configure your army. The real jaw-dropping aspect of this game however comes during the battles. Before Dragon Force there weren't too many games (if any) that had as many units on the screen at the same time going head to head in battle, without any slowdown or rendering issues whatsoever. Dragon Force stretches the Sega Saturn's hardware to the limits again, leaving all the other 32bit competitors in the dust. The battle scenes consist of two armies going head to head with massive amounts of troops on each side. You have several options to choose from during battle including how you are going to attack or guard or even flee if you have no balls. With each main character comes a special set of weapons which can also be used to blast away at the enemy. Some of these spells and attacks are absolutely stunning! I never cease to be amazed every time I fire this game up, and I've never been able to replicate exactly any one battle. Although some tactics are reused by the CPU, you always have the option to manipulate and change your style of gameplay. Even though the main part of the game consists of you making some simpler choices as to which direction to march in and where to go on a basic map, Dragon Force is an eye-candy festival throughout, especially when you utilize the Saturn's s-video output on a nice big tv the way gaming is supposed to be done. The soundtrack is your typical techno / keyboard affair and thankfully not J-Pop. Some of the tracks are even kind of groovy with a hint of Bossa Nova or Jazz. Overall Dragon Force is a powerhouse of gaming that's not to be missed by even the pickiest of gamers, and an excellent reason to own a Saturn!